“NDP Leader Thomas Mulcair poses for a photo with a supporter during a campaign stop in Toronto on Sunday, Sept. 27, 2015.” ANDREW VAUGHAN / THE CANADIAN PRESS. And tks as well to the online edition of the Toronto Star. Just before the week of September 28–October 4 began, we received a tip from the front lines of the ground war. 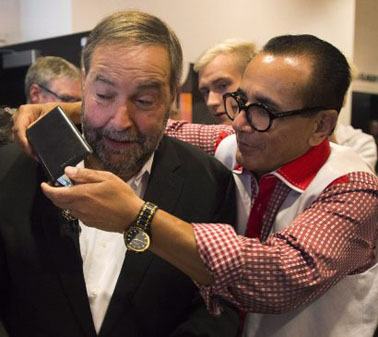 It suggested the Mulcair New Democrats were about to implode, as the 2015 Canadian federal election draws closer to the day of decision on Monday, October 19. 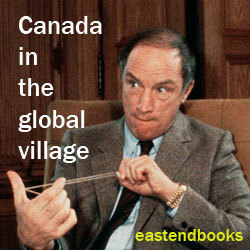 Now that the first day of the week is over, along with its attendant (and quite excellent) “Munk leaders’ debate on Canadian foreign policy in Toronto,” various strands of a similar argument have surfaced at least in the mass media of central Canada. In line with the same broad trend, if not exactly dramatically, the cross-Canada Nanos Tracking Poll released at 6 AM on Monday, September 28 had the Conservatives at 33%, Liberals 32%, and New Democrats 27%. In some quarters at least, this is seen as the start of a transition from a three-way race with roughly equal numbers for all three major parties, to a race dominated by Conservatives and Liberals, with the New Democrats increasingly confined to a dwindling third place. We remain sceptical about all this, for the time being at any rate. There are still only intermittent and short-lived signs that anyone is verging on majority government territory. 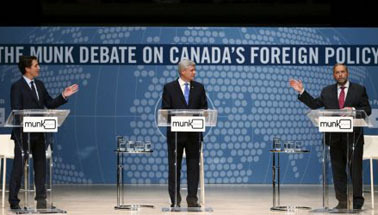 Some say the Munk debate on foreign policy, on September 28, was the best such event yet. As best we can make out at this exact moment, the essential struggle in this election is between the Harper Conservatives on the one hand and the combined forces of the progressive Liberals and New Democrats on the other. The relevant options are still not, say, a Conservative majority on the one hand and a Liberal majority on the other. They are a Conservative majority of seats in parliament on the one hand — with well under 40% of the cross-Canada popular vote — and a combined and decisive Liberal-NDP (or NDP-Liberal) majority of seats AND cross-Canada vote, brought to life by some form of progressive co-operation between the two centre-left parties. Tags: Canada's progressive majority, Canadian election 2015, Liberal-NDP co-operation in Canada, NDP down in Canada?